Godden Allen Lawn has been asked to undertake a condition survey of the all the buildings that service the much-loved but currently out-of-action Leas Lift at Folkestone. 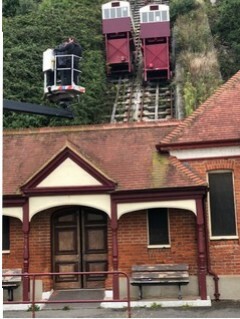 The Grade II-listed funicular railway, which carries passengers between the seafront and the promenade and dates back to 1885, has sadly been at a standstill since the Health and Safety Executive decided it needed additional safety equipment costing tens of thousands of pounds. The Folkestone Leas Lift Company CIC has beern set up with the aim of bringing the Leas Lift back into use, and fund-raising efforts are underway. Our own Gary Mead is playing his part by investigating the condition of the buildings so that the CIC will have a comprehensive schedule of what it needs to do to achieve its stated aim of “returning the buildings to a functional and safe condition and restoring the lifts to their Victorian glory”. The company wants to make sure that the Leas Lift, one of the oldest water-powered lifts in the UK, is given a sustainable and long term future, and Godden Allen Lawn is pleased to have been asked to play its part.